You're never too young to start competing in pageants. 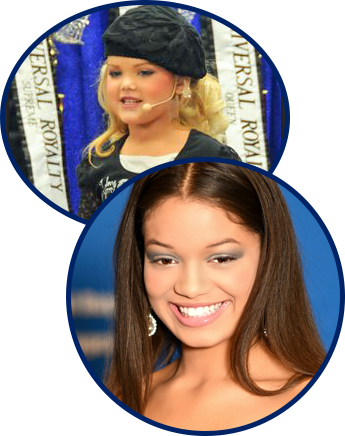 Universal Royalty® Beauty Pageant in Austin, Texas, runs pageants for children of all ages—from baby pageants to little miss beauty pageants. Come and discover all the glitz and glamour for yourself. Win your state Ambassador Universal Royalty® Title without the hassle and expense of traveling to one of your pageants. Just send us your name, phone number, and photo, along with $195, made payable to Universal Royalty®. All entrants receive an official rhinestone crown and satin monogram banner. This contest is open to boys and girls of all ages. You could become your state's Universal Royalty® Beauty Pageant State Ambassador. Enter our Beautiful Face Photo Contest for free. This online contest is open to boys, girls, babies, toddlers, and teens. Just email us your child's photo, name, and phone number and you'll be entered with a chance to win your very own Official Trademark Cover Model Poster with your child's winning photo on the poster. See your child's face on TV! When you enter your child into one of Universal Royalty®'s beauty pageants, contestants get the recognition and television exposure they deserve. Our beauty pageants create excellent television exposure for every baby, toddler, teen, and adult contestant who enters. Our pageants always generate national and International buzz.